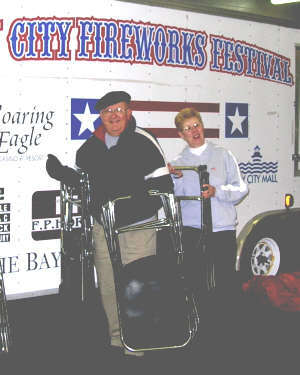 The Bay City Fireworks Festival Telethon hopes to raise $20,000 to offset the cost of the Bay City 2006 Fireworks, scheduled July 1, 2 & 3. Doug Clark, festival president, says that the committee has already trimmed $20,000 from last years' budget but costs for the 2006 celebration will still come in around $160,000. Clark says that over 100 items are going up for bid during the telethon. Cell phones, jackets, tickets to sporting events and even a couple of used cars (Donated by Labadie Motors) will be up for bidding. "We'll be here about five hours setting up," said Clark on Friday night. "Then tomorrow and Sunday, we'll put in about 33 hours of fundraising." The "Big Item" to be offered for auction this year is an Olympic T-Shirt worn by Alex Izykowski at the 2006 Winter Olympics in Turin, Italy. The T-shirt will be autographed by Izykowski and relay teammates Apolo Ohno, Rusty Smith and J.P. Kepka. The telethon will be going on (live) during the weekend at Labadie Auto Company, 711 South Euclid, Bay City, Michigan 47806. 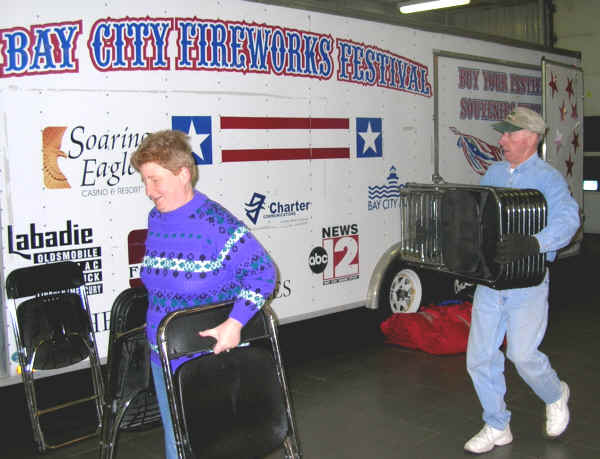 Below:(Left) Mike and Sandy Buda lend a hand during setup for the Saturday & Sunday Fireworks Telethon. 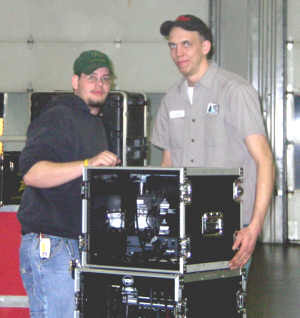 (Right)Adam Tanner (Left) and Andy Bissonnette of Bissonnette Sound and Lighting get the sound system organized. 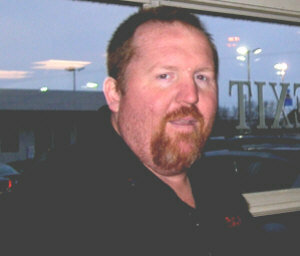 Mike Bissonnette (not pictured) said that the company has been donating time to the Fireworks Fundraisers for 30 years. Clark went on to say that auctioneers Mike Gwizdala, Jeff Doan and Dave Shore will handle most of the auction items. "These three guys are full of energy and do a fantastic job." Other "guest actioneers" expected to participate are Congressmen Jim Barcia and DaleKildee. Also, members of the local Crime Stoppers unit and a number of City Commissioners will also be on hand to take the microphone in an attempt to raise funds for the Fireworks Telethon.